We are all about leaves in our house right now, especially jumping in great big piles of them in the garden! I have two lively children who love active play, so when it comes to learning I try to find as many ways to make it playful as I can. 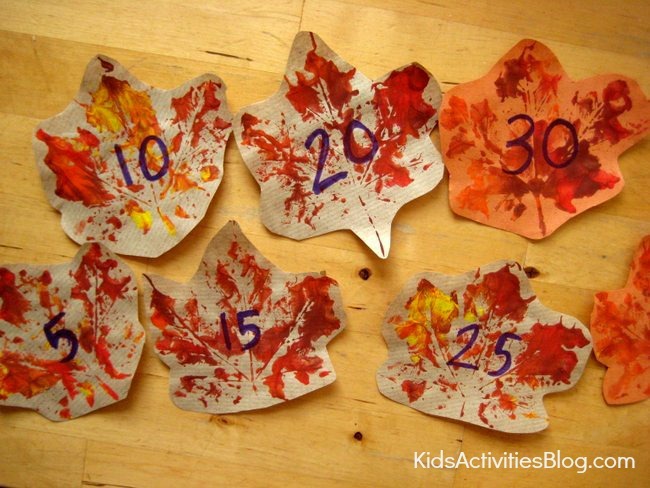 We had lots of leaf prints left over from making fall leaf wreaths, so I’ve combined them with some number games so my girls can enjoy moving around and playing some full body math games. I made a set of number leaves to start off with. I took our art leaf prints and wrote numbers on them, and then laminated them to make them robust enough to play with. You can write on any set of numbers that match with the number facts your children are working on – and if you have kids of mixed ages you can adapt the games so everyone gets a chance to play, and gets a math challenge that’s right for them. Once you have your set of leaf numbers you’re ready to play lots of active math games. Hide your leaves around the house or garden and send the children off on a treasure hunt to find as many as they can, as fast as they can. One child could collect all the even numbers, another all the multiples of ten – whatever suits the math they’re working on. Or put all your leaves in a mixed pile on the floor and play find the number: shout out sequence of numbers and see if your child can jump from one to another. Then get each child to pick out a pattern of numbers: one could find the odd numbers, one the five times table. Lay out a trail of the numbers on the floor and have the children use their body to move along the lines, learning maths patterns as they go. Lay out the numbers one to ten and tip toe along the line, counting each one out loud. Turn this into a countdown and see if you can walk backwards along your leaf number line. Lay out the two times tables and reinforce the idea that this pattern skips a number each time by hopping along the line, using just one foot. Swap over feet and hop along a line of odd numbers. Find all the fives times table and take big jumps from one number to another. You can play these inside out out, encouraging lots of healthy active play as you learn. Much more fun than just sitting at a table to learn your times tables!